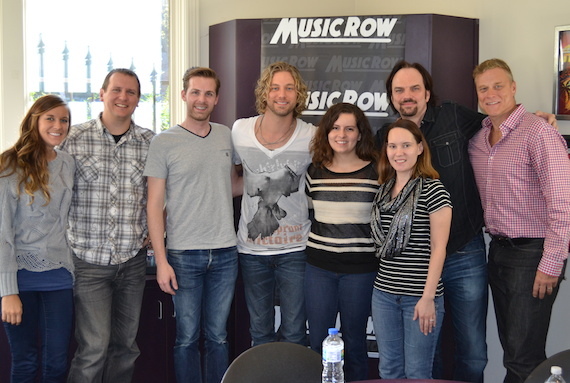 Pictured (L-R): Kelsey Grady, Troy Stephenson, Eric Parker, Casey James, Sarah Skates, Jessica Nicholson, MusicRow Owner/Publisher Sherod Robertson, and James’ manager Bryan Frasher. Season Nine American Idol finalist Casey James gained significant chart traction with his debut single, “Crying On A Suitcase,” which climbed into the Top 15 in 2012. He was later chosen by pop queen Taylor Swift as one of her openers for her 2013 Red Tour. The multi-talented Columbia Nashville artist returns to Country radio with the angst-ridden ballad “Fall Apart,” penned by Will Bowen, along with Josh Carter and Zach Carter (a sibling duo better known as Kingston). The song is the first single from James’ forthcoming sophomore project. James has worked on the upcoming album for more than two years, fine tuning the project’s layered sound along with several co-producers, including producer/engineer Julian King (Tyler Farr, Emerson Drive). “We had to pick the right co-producer for the right song. Each producer brings a different feel, a different sound. The forthcoming album is tentatively slated for a 2015 release.